Bearcub Creations: Too many good Bible Studies....Not Enough TIME!!! Too many good Bible Studies....Not Enough TIME!!! good that women of the Word are coming out with and I want to read it all! I have never been in a place where I could spend hours on end reading or studying and honestly, I've never really wanted to but as my walk with the Lord gets deeper, my desire to study HIM gets stronger. I'd love to spend my days reading and studying and diving deep into God's Word and studying these amazing books others have written but it just isn't a reality. I honestly don't think it's a reality for anyone but it's exciting to feel this way because it means I'm hungry for the Word of God! I'm hungry for what He has to teach me and I hope you are hungry too! Being in the Word of God each day and really sinking deep has created this hunger. With each meal or time spent with Him, I want MORE! I pray that you would feel this hunger too. That you would get into His Word every day. Drink deep from the Well of God and really crave to know Him more! Living Free: Learning to Pray God's Word: LifeWay is doing this as there online study and it looks soooooo good! You can join in here. She Reads Truth is going through Paul's Epistles right now. They started with Galatians September 7th and move on to Ephesians, Philippians and then Colossians. I love She Reads Truth and have used there plans to get into the Word each day and they are always soooo good! I just finished studying Ephesians with Life Lived Beautifully and it was a truly heart changing study! I learned so much from it and feeling confident to dig into God's Word on my own for the first time in a long time. Gretchen joined us most days on Periscope (you can find old posts on YouTube) to share some quick applications that have stuck out to her. 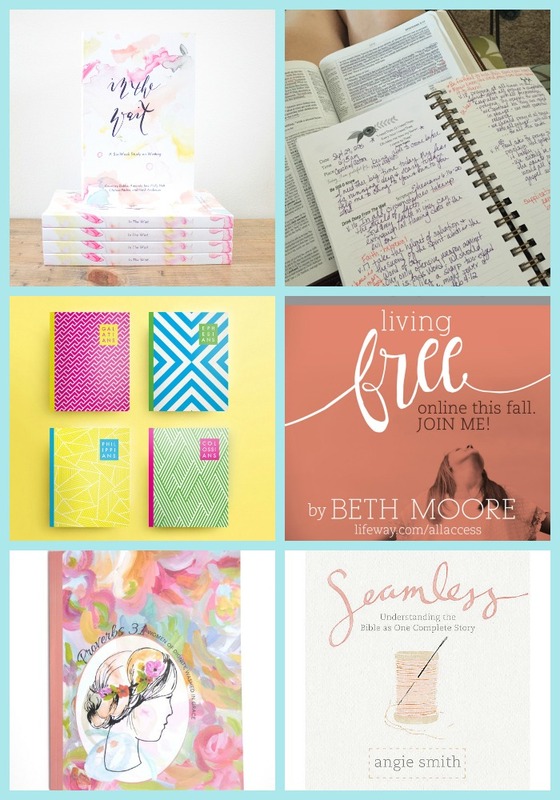 In July, we as a community went through Philippians and Gretchen was amazing at writing a blog post almost every day. Seeing how she walks through her study using her Give Me Jesus journal, gave me a great confidence to try in on my own! This summer LifeWay did an online study of Angie Smith's Seamless: Understanding the Bible as One Complete Story. It looks great too and is on my list to do at some point! I'm currently going through Proverbs 31: Women of Dignity, Washed in Grace with one of my Bible Studies and it is great! Gretchen is also coming out with a study called Planted sometime this month and it sounds like it will be really good too! In the Wait by Holly Holt and friends looks so good. It seems that we are always in a season of wait at any given time. The wait may be short or long for each thing but the struggle to wait is real for me! This study looks like a great one and I look forward to doing it soon! I am currently and slowly reading through Feminine Appeal. It can be done as a Bible study with other women or just as a stand alone book to read on your own like I am. It is a book about the character qualities/virtures of the Titus 2 women. I am only halfway through it and it is an AMAZING book that I would recommend to every christian woman I know! What are you studying? Any great books that you are going through? I'd love to hear them!